Betawi food which is influenced by many kinds of ethnic foods in the past needs to be preserved as it is our pride as an Indonesian. Betawi ethnicity, the native ethnicity of Jakarta, is formed by acculturation of many ethnicities such as Malay, Javanese, Sundanese, Bugis, Makassar, Moluccas, and Chinese. The blending results not only in high-tolerance and warm characteristics of people, but also in rich culture and arts. The fertile soil with exceptional harvest also made Betawi food colourful, unique, and tempting. What made Betawi food distinctive as well is the people’s ability to create food from unthinkable yet indigenous ingredients such as noni (morinda) leaves, durian flower, jengkol, and swamp fish like common snakehead and climbing perch. The cooking technique involves a lot of sautéing, especially for the spices and herbs. This technique is required in order to develop its aroma and flavour. Root spices like ginger are used to boil animal innards before it is cooked to remove unpleasant odor. It makes Betawi food fragrant and pleasing to eat. The key spices are salam leaves, lemongrass, and shallots. However, the distinctive factor that differentiates Betawi food with other region food is its diversity influenced by foreign people who came to Batavia harbour to trade in the past. The assimilation of Chinese people in Jakarta gave Betawi people bakmi (Chinese noodle) and bakso (meatball). The word “bak” in those foods means “pork”. 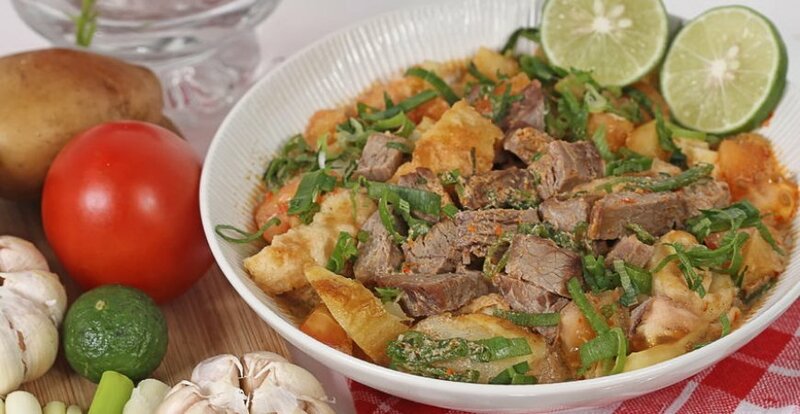 Since most of Betawi people are Moslem, they substitute pork in those dishes with halal meat such as chicken and beef. Chinese people who lived at Jakarta in the past also influenced the using of vermicelli (rice noodle) and tofu in Betawi food. The examples are soto mi, ketoprak, tauge goreng, and et cetera. Betawi food had also been influenced by India, especially from Kerala, a region famous with their skilful chefs and fantastic dishes. Indian people introduced curry into Betawi food, but the spices were slightly different as they used Indonesian spices. Indian also introduced baida roti to Betawi people, a kind of egg pancake that inspired martabak. On the tongues of men, it was Indian who taught Betawi people to cook rice with coconut milk as well. Hence, nasi uduk. Portuguese people also left their mark on Betawi food. Some of Portuguese-Betawi descendant even still lived at Kampung Tugu of North Jakarta. Portuguese-influenced foods have typical cooking style that uses charred spices. We can see them in pindang serani, a fish dish with all-charred spices. Portuguese also introduced Betawi people to the using of walnuts in dessert such as in bolu karamel and talam singkong. Dutch people who lived at Jakarta for hundred years in the past introduced European heavy ingredients such as milk, margarine, cheese, and macaroni. Those ingredients are cooked into various sweet and savory meals like dadar gulung, risoles, and macaroni schotel. Dutch also introduced braising technique (smoor) that resulted in various type of semur such as semur daging, semur telur, and the famous semur jengkol. All the assimilation of ethnic food makes Betawi food outstanding. However, the modernization and development somehow affects Betawi culture and eventually, its ethnic food. Jakarta was full of swamp that makes a perfect habitat for common snakehead and climbing perch. Now that it is replaced by houses and building, those fishes are getting scarce. Globalization also makes Betawi foods unfavourable compared to foreign food. It is our duty to preserve Indonesian ethnic food including Betawi food. In order to do that, it is not that we have to limit ourselves to eat foreign food, but we need to understand that our culinary is a part of our identity. Now, triggered by local food trends, there are some new modernized Betawi restaurants and Betawi Food Festival in Jakarta. This effort should be continuous to make sure these Betawi heritage is preserved as our pride.